Pasta alla Norma, is universally known and is a native of the city of Catania. It would seem that gave its name to the standard recipe was Nino Martoglio, the well-known playwright Catania. In front of a preparation of this recipe said: "It's a Standard" to indicate the supreme goodness compared to opera by Vincenzo Bellini. 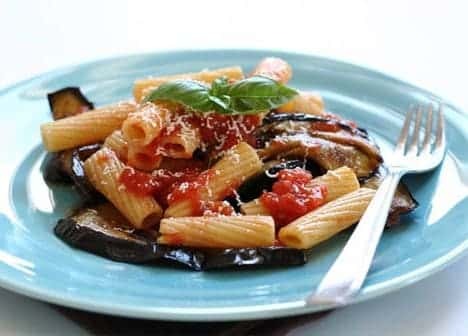 Cut the eggplant into half-inch thick slices (or cubes, as in some parts of Sicily) and let them bleed sprinkling of salt. Then fry on both sides with olive oil and place them on absorbent kitchen. Cut the tomatoes and pass them in the pan along with the finely chopped onion and fry until cooked with the remaining oil. Cook the pasta and toss with the tomato sauce. Serve on plates with the seeds on top of the eggplant and basil, ricotta salata grattuggiandovi above. Do you know this recipe for Sicilian cuisine? Contribute to this project too! Publish your images of "Pasta alla Norma".